4.5 Stars from Austenesque Reviews! Five Star Review for Chaos Comes to Longbourn! 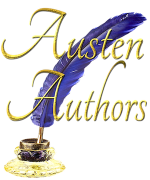 I’m a guest today at Austenesque Reviews where I talk about Austen and her use of dialogue. There’s also a giveaway and an excerpt from Chaos Comes to Longbourn! Excerpt + Giveaway with Author Victoria Kincaid!!! Why do I wish to dance with Elizabeth Bennet? This must have been the fiftieth time Darcy had asked himself that question. As he had seen her speaking with her sisters, the impulse to request her hand for the dance had been so strong that Darcy had only resisted by quitting the Netherfield ballroom altogether. He strode away from the room as fast as was socially acceptable, ignoring a few quizzical glances as he fought the impulse to return. No! Darcy paused in the middle of the corridor, resisting the impulse to bang his head against the wall. I must not think about her. Dancing with her is out of the question. Her station in life was decidedly beneath his, and many members of her family ignored proper social decorum. Even friendship was out of the question. Given how much she occupied his thoughts, he should not even speak with her. Just spying her across the room wreaked havoc with his equilibrium. Determined to leave this strange obsession behind, Darcy resumed striding along Netherfield’s back hallway. He would sequester himself in the library, where he could safely pass the time until these unbidden and unnecessary sensations had passed. He scrutinized the line of closed doors before him. Which one led to the library again? A volume of history or one of Shakespeare’s plays should serve as a sufficient distraction until he recovered his wits and could once more trust himself in Elizabeth Bennet’s presence. “Oh…Wickham!” Lydia sighed as the man traced a line of kisses from her ear to her shoulder. Truthfully it tickled, but she stifled her giggles; the man in the dashing red coat wanted to hear noises of pleasure from her. Oh, he was so romantic! Lydia could not suppress a delighted giggle this time. To be sure, no one had ever uttered similar words to any of her sisters. She was the first! Well, perhaps Mr. Bingley had said something similar to Jane but not while he kissed her neck. Lydia could barely see Wickham. His form was silhouetted by the moonlight streaming in through the window, but his face was in shadow. Not that she needed to see him when she could feel him; his hands on her back, her shoulders—even her bottom—felt deliciously illicit. “Remember that we must not tell anyone about this…little tryst,” Wickham murmured. His warm breath ghosted over her bare neck. Wickham’s mouth once again latched onto her neck. Idly, Lydia wondered which room they had slipped into. After she had consumed all those cups of wine punch, Wickham had escorted her outside to the gardens behind Netherfield, but she had objected vociferously to the cold, so he had found an unlocked door which admitted them to a dark, unoccupied room at the back of the house. They had not found a candle to light the room, but from the sound of the echoes, it must be fairly large. The floor also seemed somewhat uneven, but that might have been the effect of the wine punch. Wickham’s fingers stole inside the edges of her neckline, and Lydia gasped. What a wicked place to touch her! He paused for a moment, observing her closely, but after she smiled, he continued his exploration. Wickham’s hand slipped further into Lydia’s bodice, caressing her shoulder; he showered her mouth with sloppy, open-mouthed kisses. She moaned with a completely inauthentic enthusiasm. Denny was a far superior kisser, but he was too “proper” to do something as fun as stealing away from a dance for some laughs. Wickham was just as handsome and wore a red coat, too—and he was far more fun. Why was it so “wicked” to be alone with a man? She was supposed to attract male attention; after all, it was the whole object of a dance. Most girls her age only attracted boys, not real men like Wickham. And the way Wickham touched her was not unpleasant—for the most part. Lydia just knew that if she gave these soldiers what they wanted from her, one of them would propose marriage. Then she would be the first Bennet sister to be married—and she, the youngest of them all! As Wickham kissed her neck, Lydia stared into the darkness and smiled at that vision. However, an unwelcome thought struck her. What if Mr. Bingley proposed to Jane, and Lydia was still unwed? That would not do! She must redouble her efforts to capture Wickham’s attention. Lydia arched her back, pushing her breasts against Wickham’s chest. Men seemed to like that, and Wickham was no exception. He groaned huskily, and his hands moved to massage her back. A loosening at the back of her gown told her that Wickham had untied the laces that held her dress together. “Oh!” she exclaimed. This was a new experience but not necessarily unwelcome. Perhaps Wickham would propose if she allowed him this liberty. Her dress slid off one shoulder, baring her breast to the cool air. Lydia could not prevent a shiver. In the next moment, Wickham’s hand held her breast, mashing it most unpleasantly. But Lydia did not flinch. Perhaps this was the method for winning a proposal, although she had trouble imagining Mr. Bingley doing this with Jane. Fortunately, the act was not too uncomfortable, and Lydia wanted Wickham to like her, so she would not complain. She stared into the surrounding darkness and made the little moaning noises men seemed to like. I wonder what room we are in…? Elizabeth tended to agree; the man was unpleasant and proud. She had often caught him staring at her throughout the evening. No doubt he was cataloguing her every fault and misstep. Why did this news fill Elizabeth with unease? It was unremarkable, save that everyone in Mr. Darcy’s party seemed to believe the militia officer was untrustworthy. She tended to disbelieve them, particularly after Mr. Wickham’s description of how Mr. Darcy had treated him. Well, Mr. Wickham scarcely mattered at this moment. She must locate Lydia. Elizabeth and Jane had agreed that their youngest sister should always be supervised at such occasions. But Elizabeth had lost sight of Lydia, and Jane was dancing with Mr. Bingley. Elizabeth wanted to credit Lydia with the wisdom not to slip away with a man, but she could not be certain. The thought sent terror down her spine. What if a man hurt Lydia? Or disgraced her? The Bennet family generated quite enough gossip already; they did not need Lydia to ignite a scandal. Elizabeth grabbed her mother’s hand. “We must find her! Mrs. Bennet rolled her eyes, apparently annoyed at the prospect of protecting her daughter’s virtue. But finally she heaved a heavy sigh. “Oh, very well!” She allowed herself to be led from the ballroom. Darcy had opened three doors so far. One had proved to be a closet, and two were unused parlors. He was certain the library was along this hallway, but where? Darcy reached the last door in the hallway and opened it. The room was swathed in shadows, but the echoes and musty smell of books revealed that this was the right place. Excellent. The Netherfield library was a particularly large room, although the collection was unexceptional. It boasted several comfortable chairs, and Darcy eagerly anticipated the escape that books would provide. Perhaps Romeo and Juliet…no, a comedy. Much Ado About Nothing? Twelfth Night? A faint scuffling emanated from the other side of the room near the windows. Was there another person in the library? Someone who was sitting in the dark? Darcy experienced a surge of anxiety and anger on Bingley’s behalf. Was a guest taking advantage of Bingley’s generosity? He could think of no good reason—but a number of bad ones—why someone would lurk in a darkened library. There had been an oil lamp on the small table in the hallway. After opening the door, Darcy was able to reach out his arm until his fingers closed on the handle. When he pulled the lamp back into the library warm yellow glow illuminated his immediate neighborhood but did not reach the furthest corners of the room. “Who is there?” Darcy held the lamp aloft so the light could more easily penetrate the darkness. There. He could make out a shadowy figure—or was it two?—in the northwest corner near the door to the back gardens. Another curse in a most definitely masculine voice lent credence to Darcy’s theory, but he was not near enough to see more than two vague shapes. One moved quickly, and the door creaked open. For a moment a male figure was silhouetted against the moonlit sky, and then he was gone; the door swung shut. Was the woman still here? Another giggle answered that question. Damnation! Then there was a thump and a moan. Had the young lady hurt herself? Had the departing man injured her? What if she had been unwilling? Coming across another lamp, Darcy hastily lit it and left both blazing on a tall table behind a sofa. Now he could discern the form of a girl slumped near the door, unmoving. Was she unconscious? Darcy quickened his pace. The girl opened her eyes and blinked at him owlishly—more likely foxed than injured. She wrestled herself into a sitting position, and it was then that Darcy realized the top of her bodice was untied, exposing her breasts! He should help her cover up! No, he should leave at once! He should look! No, he should not! Torn among conflicting impulses, Darcy lurched forward, his footsteps faltering. As he neared the corner, his foot encountered an unexpected obstacle in the form of a chair leg. Darcy tripped spectacularly, falling full length on top of the half-dressed girl. The girl squealed. “Ow! You oaf! Get off! Move your hands!” Darcy hastened to comply, quickly removing his hands from anything that might resemble a female body part. “Get your hands off me!” the girl shrieked completely unnecessarily. Darcy scrambled backward, attempting to find purchase and regain his feet. Then he froze at the most horrible sound in the world: the opening of the library door. A female form entered the library from the hallway, silhouetted by candlelight from behind. “Lydia?” a voice called. Darcy had no trouble identifying its owner. Of all the women at the ball, it had to be Elizabeth Bennet. “Here, Lizzy!” the half-dressed girl called to her sister. Oh, no, no, no! Why did she say anything at all? Why could they not pretend the library was uninhabited? “I heard someone screaming,” Elizabeth said, her voice low with concern. “Yes, that was me,” Lydia admitted, not sounding in the least distressed. Darcy’s position on the floor had concealed his presence behind various pieces of furniture. His sole object was escape, through the garden door if necessary, before anyone connected him with this awkward and scandalous situation. But every escape route involved standing. So Darcy stood hastily, not even taking a second to straighten his badly disheveled clothes, and gingerly stepped toward the door. Perhaps Elizabeth would not recognize him from the back. He turned slowly to face her. There was no purpose to be served in dissembling. Elizabeth’s brow furrowed in perplexity as she regarded him. Then Lydia Bennet stood up, and Elizabeth’s mouth gaped open. Miss Lydia used one hand to preserve her modesty by clutching the front of her unlaced dress to her chest. The dress sagged alarmingly; one sleeve had fallen from her shoulder, and the other was balanced rather precariously. “Lydia, you must cover yourself!” Elizabeth cried, hastening across the room. Darcy jerked his eyes away so quickly that he had a moment of vertigo. Instead, he was treated to the sight of Mrs. Bennet joining their merry band. She bustled through the doorway officiously but gaped at what she saw. “Lydia!” Mrs. Bennet shrieked at her youngest daughter. Mrs. Bennet shrieked again, a wordless cry of dismay. Darcy was tempted to cover his ears but could not quite bring himself to be so impolite. Glancing down at the loosened bodice, Lydia giggled. “No wonder it feels so cold in here!” With a little smirk, she yanked up the sleeves so the bodice did not hang so precariously. Standing behind her sister, Elizabeth hastily tied the laces on the back of Lydia’s bodice. Elizabeth glared at Darcy—at which point he realized that perhaps he should avert his eyes. The carpet. It was a very fine carpet, and no one would object if he stared at it. Oh, this was not good. Not good. Not good at all. Darcy had been caught in a darkened room with a foxed, partially clad girl from a respectable family. No matter what he said, the circumstances were incriminating. There must be a way to address this situation before it spins out of control. But Darcy’s mind was not working properly. The combination of naked breasts, Elizabeth’s scorn, and Mrs. Bennet’s continued shrieking had somehow rendered his mind nonfunctional. He felt like a fox at the end of a fox hunt—surrounded on all sides. “You came to be alone with my half-dressed sister in a dimly lit library by accident?” Elizabeth scoffed. Darcy could not prevent a wince; of all the women at the ball, why was she the one to have discovered him in this ridiculous situation? Darcy drew himself up and straightened his cravat. “Well, yes.” He was aware how absurd the claim sounded, but it was the truth. “When I arrived, Miss Lydia was lying in the corner. I wanted to help her, but I tripped and fell on top…” Darcy’s voice petered out. Any details he added at this point would only make the situation worse. It did not help that Lydia chose that moment to burst into tears. “I never thought very highly of you, Mr. Darcy,” Elizabeth intoned as she put a comforting arm around her sister’s shoulders. Oh, Good Lord! The girl was fifteen? Georgiana was barely older. Elizabeth’s family would think him scarcely better than Wickham. No, it was intolerable! “How convenient for you,” Elizabeth sneered. Her words were punctuated by a sob from her sister. Just as the words left his mouth, Darcy realized how badly he had miscalculated. Lydia’s hands fell from her tear-streaked face, her eyes wide with horror. She would never admit she had willingly accompanied a man into a darkened room. Mrs. Bennet and Elizabeth stared at Lydia. “Lydia, what happened?” Elizabeth asked gently. For a moment Darcy entertained the hope that Lydia would tell the truth, but then she shook her head vigorously. “No! There was never anyone else. I am not that sort of girl!” She dabbed her eyes theatrically with a handkerchief. Some man had undoubtedly lured her away from the dance with promises and flattery she was too naïve to question. If she were not seeking to tarnish his reputation, Darcy would feel more than a fleeting moment of sympathy. Mrs. Bennet’s shrieks had brought a throng of guests crowding around the library’s doorway, including—much to Darcy’s horror—Bingley and Mr. Bennet. Behind them stood that fool of a cleric, Elizabeth’s cousin. Darcy’s stomach clenched and roiled at the sight of so many eyes observing and judging him. Darcy refrained from observing that the situation could have been concealed were it not for Mrs. Bennet’s shrieks. A herd of horses galloped through his stomach, and his heart threatened to pound out of his chest. Oh, merciful heavens! Lydia’s father expected him to offer marriage. Let this be some horrible dream! Darcy paused. Unfortunately, he did not awaken. Darcy stared at Lydia Bennet: silly, sobbing, foxed, and willing to leave a ball unchaperoned with some unknown man. Without any family position, good understanding, or clever conversation, she met none of his criteria for a wife. In fact, she was the exact opposite in almost every way. If he had wanted a young, empty-headed chit, the ton could supply many with impeccable pedigrees. His eyes brushed past Elizabeth, who glared at him implacably. Asking her to dance was the least of his concerns now. The thought struck him as darkly humorous. However, he was troubled by the thought that she would think ill of him, that she would see him as capable of seducing and abandoning her sister. She had already declared her low opinion of him; he would hate to confirm it. If he failed to propose now, Elizabeth and the other onlookers would think him without honor. But the thought of proposing was…profoundly distasteful. Of course, a proposal was not a marriage. If he proposed under duress now, Darcy might later find a way to escape the obligation. The Bennet family might agree to a monetary settlement, but they could hardly discuss such a compromise here, in front of witnesses. Yes, he would find the means to escape the situation later. For now he need only scrape together the remains of his dignity and live to fight another day. Devil take it! He turned to the disheveled, red-faced, sobbing fifteen-year-old. “Miss Lydia,” he said through gritted teeth. “Y-yes?” She granted him a quizzical smile and a hiccup. “Would you do me the honor of being my wife?” Darcy was proud he did not choke on the words. He did not have the slightest hope the chit would reject him; his fortune was too tempting. Darcy failed to see any humor in the situation. “W-why would I want to marry you?” She giggled, swaying a bit on her feet. Was the girl touched in the head? “But look at him!” She waved wildly at Darcy. “He’s so stuffy and formal and dull. And he does not even possess a red coat!” A couple of onlookers tittered. Even Mr. Bennet’s lips twitched. However, Elizabeth’s glare did not relent. Darcy rubbed the back of his neck. This was a farce in every possible way. “I don’t want to!” Lydia stamped her foot like a child denied a sweet. Lydia glared at her father. “Papa, that is unfair!” He crossed his arms and regarded her sternly. Finally, she stepped backward and slumped into a chair with a huff. “Very well! Yes, Mr. Darcy, I accept.” Her face arranged itself in a very unattractive pout. Darcy wondered if there had ever been a less romantic marriage proposal in the history of the world. However, if Lydia possessed that little enthusiasm, perhaps they could reach some sort of agreement which would not leave him leg-shackled. Never before had he been grateful for being considered dull! Of course, he had never before encountered a woman who thought ten thousand a year was dull. Bingley began to direct guests—all chatting excitedly—toward the library door. Lydia returned to sobbing into her hands. With a scowl at Darcy, Mrs. Bennet swept across the floor to take the chair next to Lydia’s. “It will not be so bad, my dear. Mr. Darcy is very rich.” Standing next to Lydia, Elizabeth colored at her mother’s tactlessness. Darcy closed his eyes. This could not possibly be happening. “Rich?” Despite being muffled, Lydia’s tone was definitely interested. Lydia clapped in excitement. “La!” she squealed. “How droll!” She certainly recovered from her mortification quickly. Darcy could almost see the hope for an agreement with Lydia slipping further away. Why would the girl accept a fraction of his fortune when she believed she was entitled to all of it? But there was nothing he could accomplish tonight. Perhaps he could convince Lydia to break off their engagement tomorrow, once she had sobered. Darcy spun on his heel and strode toward the hallway. He needed a brandy. Or two. Or ten. “Yes, indeed!” Lydia agreed with a giggle. Lydia might like being Mrs. Darcy, but Darcy could not conceive how he would survive Lydia. Great Review from Of Pens and Pages Blog! Great Review from Of Pens and Pages! “What a book! I was quite apprehensive to start this book since I could never imagine dear Mr. Darcy with anyone other than Elizabeth. I couldn’t even imagine myself with him! Nevertheless, I’m happy I read this book. ‘Chaos’ wouldn’t be enough to describe the events in this book…. Guest Blog and Giveaway at Diary of an Eccentric! Check out my guest blog at Diary of an Eccentric — where I talk about humor in Jane Austen and the role it plays in my P&P variations. There’s also an excerpt from Chaos Comes to Longbourn and a giveaway of ebook or paperback (winner’s choice).